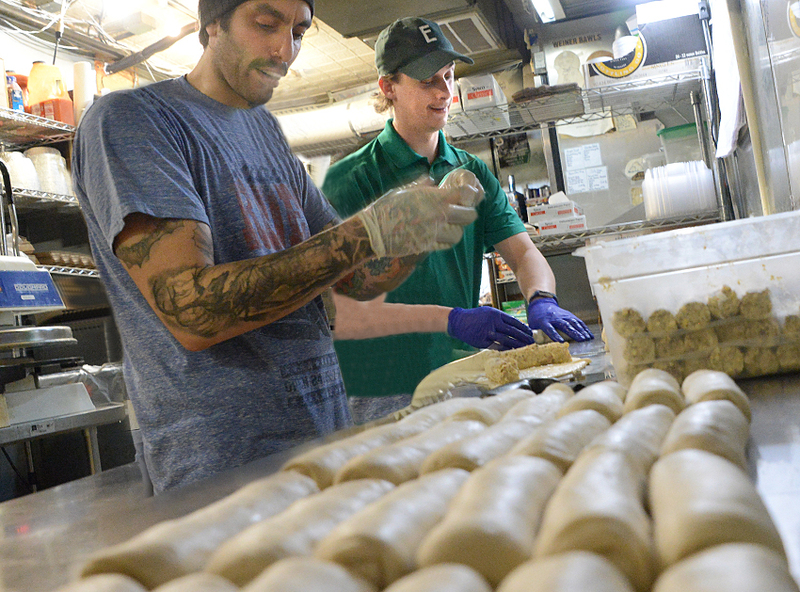 Staff at Esperanto in Saratoga Springs is busy making its DoughBoys For Stewart’s Shops. Esperanto, a restaurant on Caroline Street in Saratoga Springs, has for years made the DoughBoy, a popular quick-grab snack, a feature of its varied menu. This dough, about the size of a hotdog on a bun, filled with chicken, cheese and scallions, can now be found in Stewart’s Shops across the region. The agreement to supply DoughBoys to the well-known store chain, has sparked the need for Esperanto to expand. Esperanto has been working non-stop to keep up with the new demand, and owner Will Pouch is pleased to make as many doughboys as their fans desire. “People love them, and we are happy to make them,” said Pouch. Pouch said he was thinking about approaching Stewart’s, but they came to him first with the idea of making DoughBoys available for a quick “grab and go” type food item at their stores. They started off in a Saratoga store in late October, where they sold immediately. They are now being sold at 23 different Stewart’s shops across the Capital District, with additional locations in college towns like Plattsburgh and Potsdam. “We have always found a huge success with college kids, so it made sense to go to those areas,” said Pouch. Chris Biddle, co-manager of Esperanto’s, said Stewart’s is reporting back to them that many people are grabbing them with their coffee in the morning. “People are grabbing two, three, even four, for breakfast in the morning. We are reaching a population that is on their way to work. We are hearing that high school kids stop in to eat them as well,” said Biddle. Jeff Vigliotta, Stewart’s Shops Corp. marketing coordinator, said with both businesses being based in Saratoga Springs, it has been a successful partnership. “Logistically, it was an easy for Esperanto to deliver their product to our distribution center in Greenfield. We then can ship the product to our shops on our own trucks, which makes it easier on shop partners to order product. We do enjoy working with local companies and we are fortunate that we can test items in select shops,” said Vigliotta. Vigliotta said the response has been very positive, with many patrons familiar with doughboys already. “It is another easy food option for our customers at Stewart’s,” said Vigliotta. In early February, Vigliotta said Stewart’s started adding DoughBoys at more stores, expanding into the Capital District and beyond. “Overall, we are happy with our arrangement with Esperanto’s and are glad that we can work with other local businesses that are a win-win situation for both parties, “said Vigliotta. “Stewart’s has been amazing and this has exceeded my expectations, “said Pouch. Pouch said they are also working with three Jiffy Mart stores in Troy, where again, the response from customers has been very positive. Pouch said they are in the process of putting together plans for a USDA approved baking facility where they can bake, store and ship DoughBoys. The facility would support their plans to keep up with current consumer demand, as well as future plans to sell at more locations. “People go nuts over these things. It’s time to go into wider markets,” said Pouch.